It is New Character Week over at Skull Panda, apparently! I am not entirely sure what that means. It's also almost Emerald City Comic-Con time! The show starts this Friday, and as usual, I will be hanging out at the Topatoco booth. Hope to see a lot of you there, Seattle-ites! And just a note: I am down to my last couple of Sketch-Off originals. If you want to pick one up, just pop into the gallery and see what's left! Just a reminder, team... the auction for Chris Yates and I's one-of-a-kind Conscience Cat & Baker Wood Puzzle auction ends today! So if you want to nab it, get in while the getting is good. "Why exactly is Sam not wearing any sort of disguise? I mean, it's obvious that people recognise him for who he is in this city, and 2 people have already called him out. As far as I can tell, Sam isn't that stupid. After going to all the trouble to make a new identity, isn't it kinda obvious that you shouldn't come looking exactly like the guy you're trying not to be? This might have become more obvious since you first sent me this question, but: Sam isn't wearing a disguise because he doesn't have to wear a disguise! As far as the law is concerned, he's a different person now... such is the all-reaching power of the committee. (As we've seen before with Mr. Sin.) He is legally untouchable, at least as far as his past life is concerned, so no matter how many people recognize him, he can't be arrested for anything the "old" him did. Now, if Sam was looking for a fresh start, then sure, he'd probably throw on a disguise and try to start a new, unrecognizable life. But I don't think Sam is looking for a fresh start. I think he's looking to pick up exactly where he left off, and flaunt his ability to do so in a bitter and sarcastic fashion. The tequila monster is all Jeph's! Fuzzy was strictly temporarily filling-in for the real tequila monster. The idea was suggested in the livestream chat while I was doing the "New Jobs" Sketch-Off, and since Jeph is one of my oldest webcomic bros, I thought it'd be a fun thing to do. And it was! 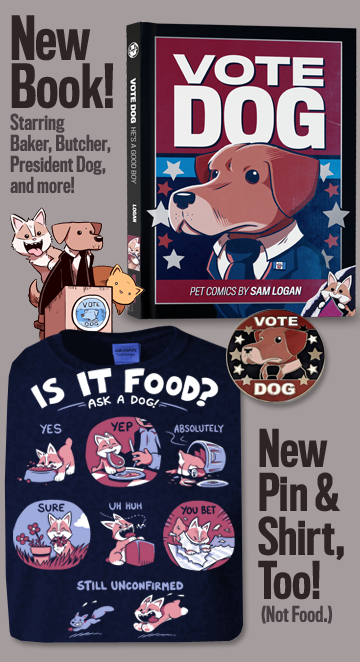 It's not something that's set up in my current archive system... but we are in the process of building a brand new Sam and Fuzzy site! (HONEST!) So maybe... in the future! 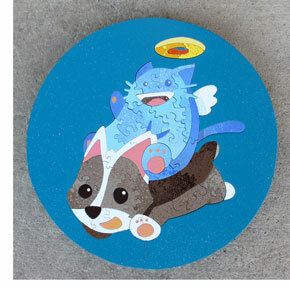 Custom Conscience Cat & Baker "Baffler" auctioning off now! The crazy-talented Chris Yates, creator of countless one-of-a-kind hand-cut wood puzzles, has once again teamed-up with a bunch of webcomics folks to create some... uh... one-of-a-kind hand-cut wood puzzles! Our collaboration resulted in the super-cute "Corgi with a Conscience" puzzle you see to your right. It is now up for auction on ebay, and can be bid on until this Friday. 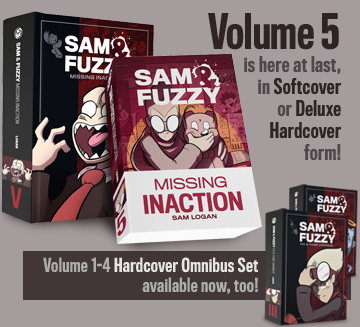 So if you'd like to nab a piece of unique Sam and Fuzzy-themed puzzle art -- and support a pair of independent artists in the process -- now is the time to throw your hat into the ring!